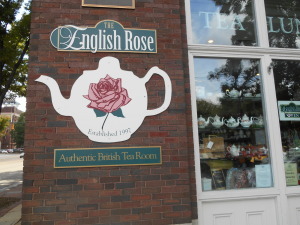 I recently went to the English Rose Tea Room in Chattanooga across from the Chattanooga Choo-Choo. I love Chattanooga and I love tea so I dragged some friends along and went a couple of times to test it out. 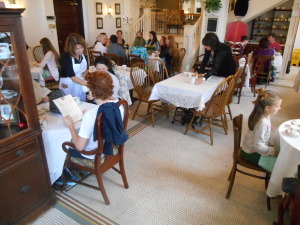 One cool aspect of the English Rose Tea Room is that it is in a historical building. It was a hotel once upon a time. Now there are apartments upstairs and the street level is occupied by the tea room and offices. That explains the stairway that goes to nowhere in the back of the tea room. They said the mosaic tile floor is original to the building. 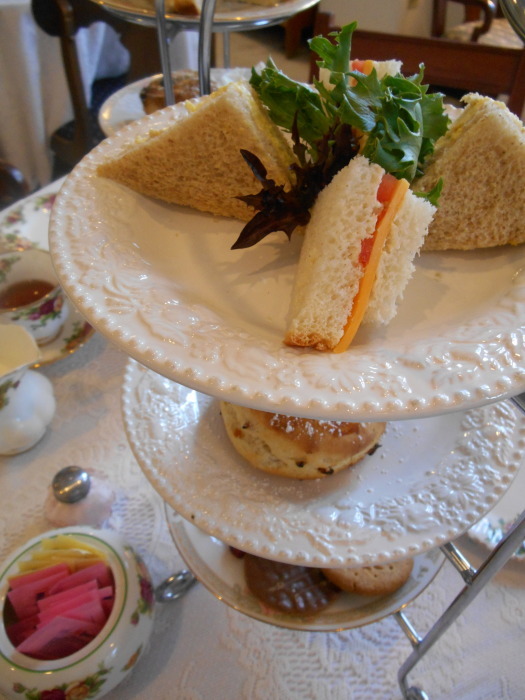 The first time we went I thought we’d try their Victorian Tea which includes a pot of their House Tea, four finger sandwiches, raisin scone served with clotted cream, jam and lemon curd, cheese and crackers with choice of dessert all for $19.95. Not a bad price. The sandwiches were salmon mousse, egg salad, herbed cream cheese with cucumber, and tomato and cheese. However, as the saying goes, you get what you pay for. I have to say that the food was a bit average and very ho-hum. The best part was the scone. However, there were several dreadful sins. First of all the tomato and cheese sandwich was just that – a slice of tomato with what looked like American Cheese on white bread. The cookies and the cheese and crackers were just packaged products stuck on our plate. They had some pretty china but their eye toward decorating details seemed lacking. You can see the sugar substitute packages, the cream and jams were served in little plastic solo cups and they had artificial flowers on the table. I understand some people want to have the fake sugar and it must be served in a uncontaminated fashion but cover it up so it doesn’t look tacky. Please don’t serve plastic solo cups on the same table as china and for heaven’s sake get some real flowers. They don’t have to cost a lot and they won’t collect dust. The most disappointing aspect was the very limited selection of tea that they had. We had the Darjeeling and also tried the House Tea. Normally, Darjeeling is very refined. It was not. Their version was harsh, overbrewed and bitter. It was loose leaf tea but they steeped it in a paper tea pouch that had a tail hanging out of the teapot. Not elegant at all. The house tea was better and it was dark and strong but still not anything special. 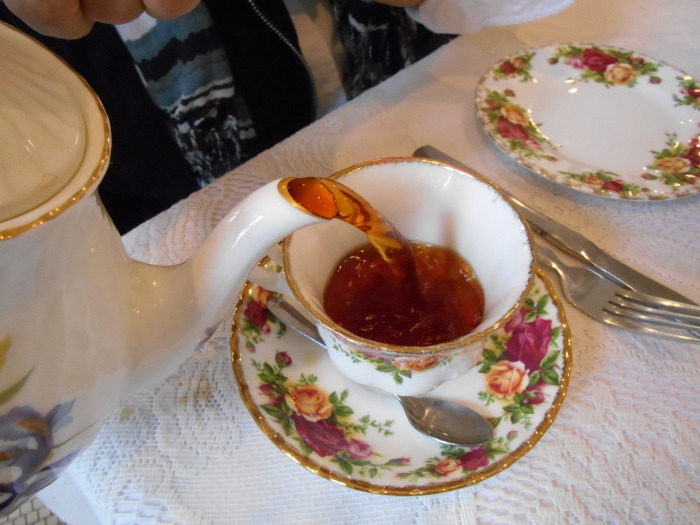 I did think that the plain old lunches around us looked better than what we had so I wanted to give the English Rose Tea Room another chance. We did and I was happier the second time around. This time I had the spinach quiche and a bowl of potato soup. It was good. My friend had the gluten free Cottage Pie made with ground sirloin with gravy, peas and carrots, topped with homemade mashed potatoes. She said it was great and we both ate up our lunches. I was impressed that the crowd was mixed gender. There were almost as many men as there were women in the restaurant. We did speak to the owner who said she bought the place from the first owner who was British and she learned the recipes and cooking from her. She was a very nice lady and I wish her well. I’d give it 2 1/2 stars out of five. Go and enjoy Chattanooga and the tea room but stick with items off the lunch menu and don’t try anything fancy.